Experimental rock collective Enablers are set to release their fifth album, The Rightful Pivot, this year, which follows 2011’s Blown Realms & Stalled Explosions. Led by the dramatic spoken word of Pete Simonelli, the band is also comprised of guitarist Joe Goldring (who was in Soundtracks for the Blind-era Swans), guitarist/bassist Kevin Thomson, and newly-added drummer Sam Ospovat, who among other things, contributed to tUnE-yArDs’ album, whokill. (Their last album was recorded with Codeine/June of 44/Rex/HiM drummer Doug Scharin, who has since left.) You can watch the trailer for the new album below, and while no music from that has been released, two songs from the 2011 LP are below as well. If you’re unfamiliar, it pretty much sounds like what you’d expect from a band with a Swans member and a legendary post-rock drummer, which is to say, very good. 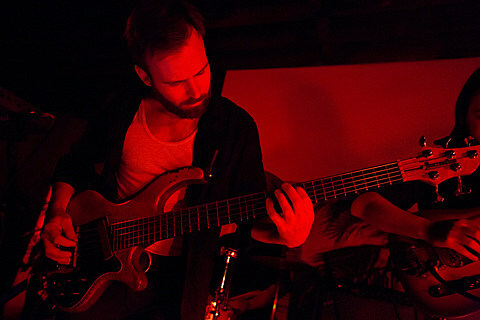 Enablers have tour dates coming up, including a NYC show with Kayo Dot, whose frontman Toby Driver booked them at his Stone residency in 2010. That show happens February 25 at Mercury Lounge, also with Insect Ark (Dana Schecter of Michael Gira’s post-Swans band Angels of Light) and another likeminded local band, Center Divider. Tickets for that show are on sale now. All Enablers dates are listed below. Kayo Dot also have another NYC show happening sooner at new Bushwick venue/restuarant/motorcycle garage The Shop on January 24. That show is with Gnaw, who played that same Stone residency in 2010 and recently appeared at Year of No Light’s NYC debut, and two more TBA. Tickets are on sale now.